This one just blows me away! I am going to let Jane tell you all about it but let me mention first -- what we offer here is the printed pattern; if you prefer a PDF file, Jane offers that on her website. "The season changes sending gold-charged light through the trees. Leaves ripen burnished on the branches as cool chills the air. Celebrate the change with the Four Winds Wrap, a big, luxurious piece of wearable art to knit on large needles with lots of lustrous yarn in shades of luminous orange and toasted reds. One end sports a single big leaf dangling from an i-cord from which bands of drop stitch and seed gradually widen into a central long leaf motif in simple intarsia. 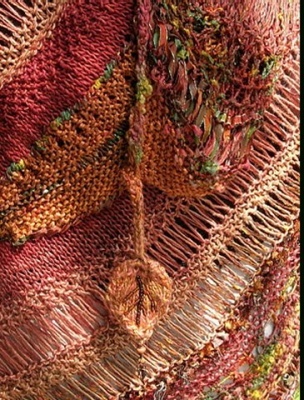 Moving from the leaf motif to the other end, the wrap slowly tapers to a straight edge from which a trio of beaded leaves fall." Sound complicated? Make it as complex or easy as you want, as big or small as you desire. Skip the leaves and tie on beribboned streamers or bypass the intarsia motif in favour of garter or continued drop and seed. 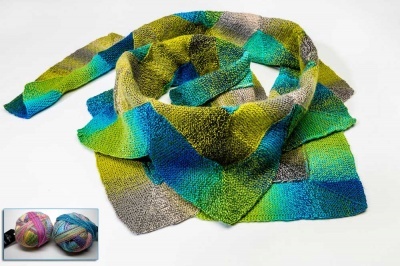 In free-range knitting, the spirit moves you and every created item is one of a kind. THERE SIMPLY IS NO WRONG WAY. Stitches used: seed, garter, drop, yarn over, i-cord and slip stitch (for the 3-dimensional leaves). 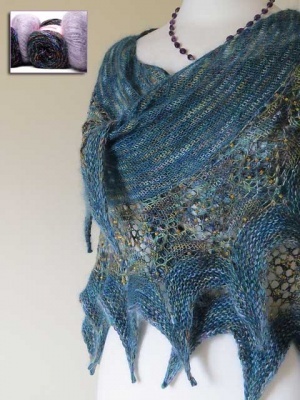 The drop stitches create an open, flowing wrap with a lovely drape. 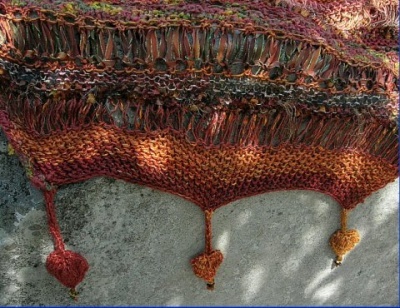 Remember that knitting free-range style requires a different approach than regular, pattern-driven knitting. Here, it’s necessary to release your expectations of achieving an outcome EXACTLY LIKE THE ORIGINAL. Free range knitting is about following your own knitting spirit and letting go. Make your creation uniquely your own (with a little help from me along the way), using a process as loose and flowing as the wind itself. The design incorporated beads (which makes this extra special to us). You will want some small beads with an AB finish or an iris finish -- any of the metallics would look great. You also will want a mix of various beads to help with the embellishments during finishing. To quote Jane again (she says it so well): "Remember, when it comes to embellishment, mucho is mucho. Leave the minimalist notions for office buildings, banks and the faint of heart." So if you would like us to include a small bag of various and sundry beads for your wrap, choose the option below and make sure to tell us (using the "Comments" section as you check out) any thoughts or ideas you have color-wise. We will do our best to send things to add interest to your piece. This one is special indeed.